We all know that 2012 was an important year for Sport, with the worlds eyes all focused on London in its attempts to “Inspire a generation” & “Build a Legacy” and now could not be a better time to keep the inspiration going with a Sport Themed Activity Day. Whether the event is for adults or children, we have many activities that would suit your requirements. 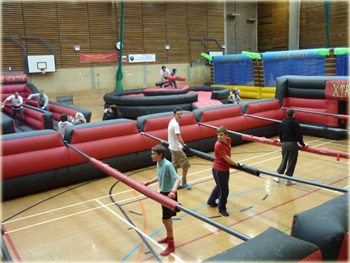 From Human Table Football to Bouncy Volleyball, we have many sport themed activities to create a unique sporting event. Visit our activity hire page for all of our sporting activities for your activity day. Our Sports Activity Day and activities are suitable for many events such as School Activity Day with a sporting theme, Family Fun Days and Corporate Activity Day looking to celebrate the sporting events of present and future.